with the weight of 25Kg bags of salt or the price premium of block salt ? Since all water softeners actually use a brine solution, not dry salt in their recharge process, they can't actually tell the difference between block salt, tablet salt or granular salt. 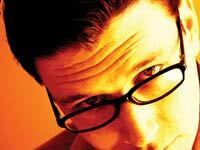 So like all water softeners, the Ensign machines can use all types of salt; granular, tablets and block salt. However since 1998, water softener salt has been available in the 10Kg bag size, which is popular, very convenient for the user to handle and is increasingly taking over from the traditional heavy 25Kg bag size. We think the 10Kg size is so good we want you to try some when you next purchase your water softener salt. We think you'll like it. 8Kg pack Compacted salt in the form of a single 4Kg block the size of a house brick. Sold in 8Kg packs. Can be used in all water softeners. Easy to handle. 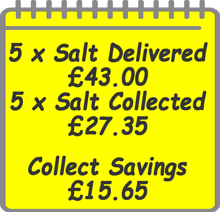 10Kg bag Compacted salt in the form of multiple 1.5cm tablets. Introduced 1998. Sold in 10Kg polythene bags with handle. 25Kg bag Pre 1998 size. Increasingly redundant size caused by the introduction of the 10Kg tablet salt size. 10Kg bag Low density salt. 1.0mm to 3.5mm crystals. Could be used in all water softeners, but is increasingly less popular due to difficulty in handling such a large size and very messy in use. Got a Block Salt Softener? This is simply a water softener in which the manufacturer promotes the use of premium priced block salt only. In reality it can use tablet salt as well but the customer is obliged into expensive brand loyalty by a rather unfair claim that their warranty 'might' be voided by the use of any other brand of salt. Ouch! 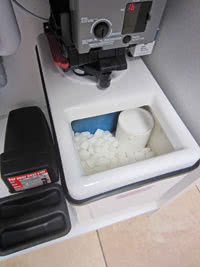 It's very easy to fill the softener with the 10Kg size and has a carry handle. It's produced to an International food grade quality ISO 9001. It's widely available from different suppliers so you won't be tied to just one source. Nowadays, it costs similar per Kg to buy an equal weight in 10Kg bags rather than the older 25Kg bag size. It can be used in all types of water softener. It costs a lot less than block salt! Did you know that more and more people use the 10Kg tablet salt bags these days.